Historians, biblical scholars and students of classical Greece alike no longer have to make the trip to the British Library’s reading rooms since most of the British Library’s Greek manuscripts are now accessible online. As a result of the Library’s Greek Manuscripts Digitisation Project, which began in 2008 and is funded by the Stavros Niarchos Foundation, full digital coverage and new catalogue descriptions of 905 Greek manuscripts are now available to researchers with high resolution colour images of each manuscript, including flyleaves and bindings, with an up-to-date description of its content and codicological features, and an extensive bibliography. The British Library’s collection of Greek manuscript codices is one of the most substantial in the world, comprising around 1,000 items. Ranging in date from the 3rd century BC to the present century and in format from papyrus rolls and codices to ostraca, wooden and metal tablets, parchment and paper documents and codices, they bear eloquent testimony to the rich culture of Greek-speaking people from the time of the creation of the Iliad and Odyssey through the classical, Hellenistic, early Christian, Byzantine and Ottoman eras and beyond the creation of the Greek nation state. They also exemplify the passionate interest of successive generations of British scholars and collectors in Hellenic culture. The collection has considerable depth, including, for example, two of the three oldest Greek Bibles, the remains of some 227 manuscripts of the Greek New Testament, and around 50 Greek codices dating from the first millennium. The collection has been built up over several centuries through purchase and donation. Its development reflects the opportunism and discrimination of successive Keepers of Manuscripts, as well as past trends in scholarship and collecting within Britain. This diverse content can now be explored online in three different ways. Using the Library's Explore the Archives and Manuscripts, you can search for any names, places and keywords — including authors, titles, scribes and owners — in the descriptions of hundreds of Greek manuscripts. Once an item has been identified, a link (“I want this”) enables the user to order the original manuscript to the Reading Room in London or to view its full digital version online. Another way to explore Greek manuscripts is via the British Library’s Digitised Manuscripts site, which is also searchable by using various keywords. After identifying the chosen manuscript, you can immediately start browsing the images of its pages, which once would only have been accessible to scholars visiting the Library in person. 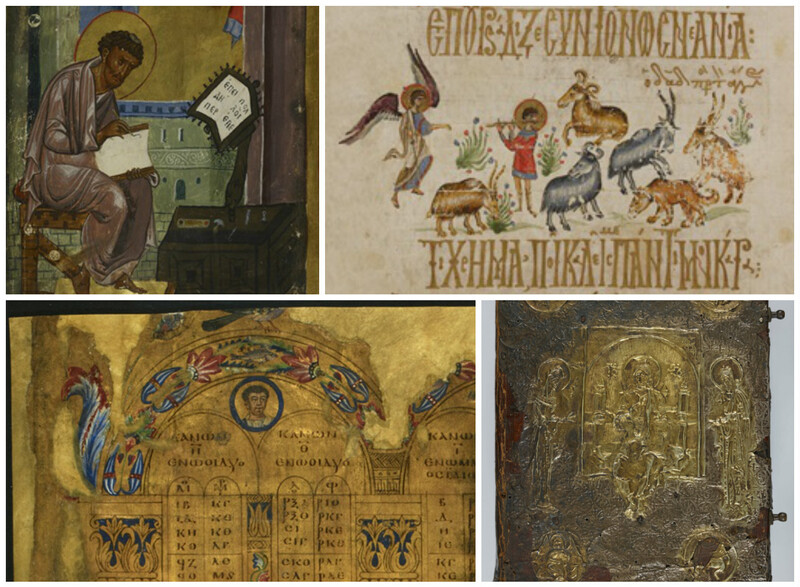 A third way to explore digitised Greek manuscripts is by using the Library’s new Greek Manuscripts website, which offers a free guided tour throughout the collections. Let experts guide you through their richly illustrated introductions to themes such as Art, Religion and Scholarship. 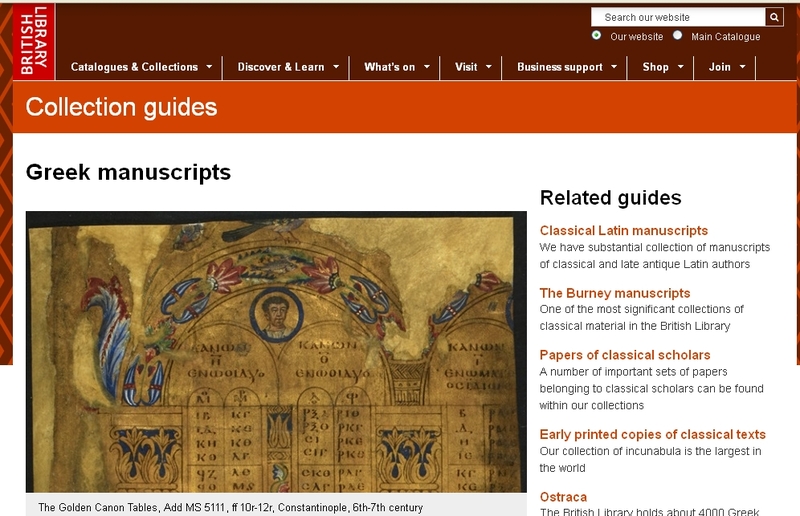 Explore some of the highlights of the British Library's collection items, read articles by leading experts on Greek manuscripts, discover themes running through the collections, and watch videos on key topics.